Most abuelas think leftovers are a crime, so instead they make you stay at the table until everyone’s plates are clean, but some people look forward to the "recalentado" (leftover lunch) as the best meal each Christmas! If you or your family is anything like this, we have the best ideas on how to transform your leftovers and keep your family delighted from Christmas Eve to Christmas Day. From easy pressed sandwiches to comforting soups, these recipes are super easy because all your ingredients are already prepared. Let us rejoice! Food Network’s Day-After Turkey Soup: Not only is this the perfect comfort food dish for a winter’s day, but it’s also a one-pot wonder. You’ll have the turkey meat and broth ready; prep the veggies in advance and let the flavors come together in the oven! It doesn’t get much easier than that. 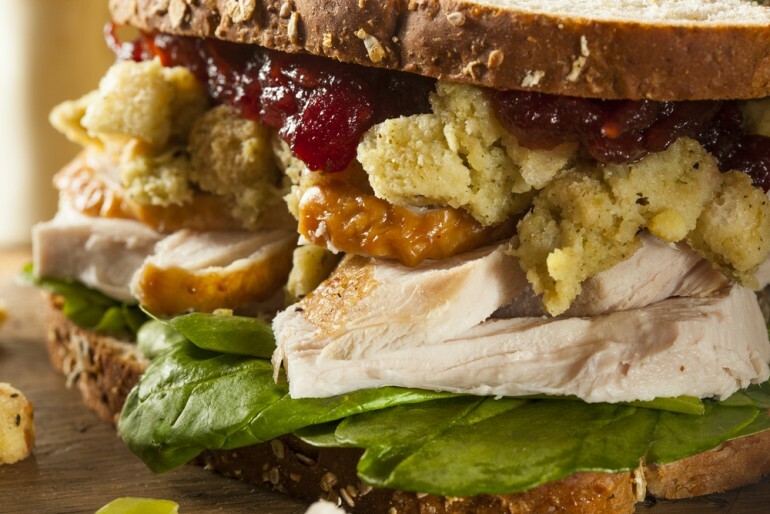 Kraft Food’s Leftover Turkey Sandwich: This one’s a personal favorite for me, and there is no right way to make a turkey sandwich on Christmas day, but this version has it all: the stuffing, some cranberry, mayo and turkey. Check it out! Martha Stewart’s Potato Croquettes: If you want to get a bit craftier in the kitchen, these are the perfect way to go. You’ll use your leftover turkey meat, mashed potatoes and cranberry, and you can get the kids to help. They’re sure to be crowd pleasers, you’ll see! About Food’s Turkey Tamales: These might not take the most authentic route but that doesn’t mean they won’t taste delicious. Use your leftover cornbread stuffing as the batter (moistened with gravy) and prepare the turkey filling just like it says here. You will no doubt wow your guests! Southern Living’s Turkey Salad with Cranberry Dressing: It’s very likely that you and your family over did it the night before, so why not try a lighter version with a turkey salad. It’s also super simple: simply use mixed greens, any leftover green veggies, leftover turkey meat and make a quick cranberry dressing. Voila! Epcurious’ Turkey Enchiladas: You can prepare these enchiladas as you normally would. Stuff the corn tortillas with shredded turkey, roll them up, place them in the recipient and cover with sauce, sour cream and queso. Amazing! Southern Living’s Turkey Tostadas with Spicy Cranberry-Chipotle Sauce: If you have leftover tortillas and turkey, you’re more than set. Bake or frie the tortillas until crisp, and top them with refried beans, leftover turkey, and maybe even some of those leftover veggies as well. This recipe calls for a tangy cranberry chipotle salsa, which is totally optional but sounds delicious. Try these out! Martha Stewart’s Cranberry Pancakes: A sweet tangy breakfast is only a few steps away if you decide to use your leftover cranberries in the batter and as syrup. You can be sure the whole house will smell like Christmas morning!